For years when I first started training, I went to a women-only gym. It was fantastic - virtually all the other members were scared of the free weights, so I had the downstairs weights area all to myself at 6:00am, while everyone else was upstairs on the cardio machines, or maybe doing the rounds of the weights machines. The gyms I frequented after that were bodybuilding gyms - and no self-respecting guy would be caught dead with a dumbbell under 20kg. So, yay! That left plenty for meeee! So I was peeved this morning when I wanted to do some dumbbell bench presses, and being cautious, thought I'd start with maybe 5 or 6 kg. 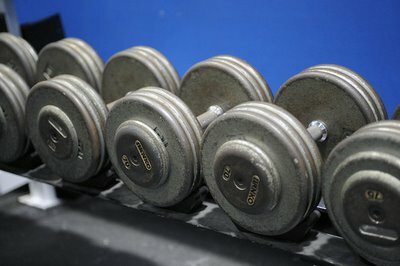 There were four blokes in the weights area, each with a pile of DBs at their feet (why do guys DO that? ), and the smallest weights left on the rack were 8kg. I hate that too. It like they surround themselves with a little dumbell security blankett. Usually I politely ask 'which set of those are you currently using, cause I'd like to workout too'.90% of the time they happily give up at least one set. The other 10% of the time I just grab a pair from their feet anyway. Yep Kek, that's one good thing about being a 'girl' in the weights room. You usually get choice pick of the 'smaller' weights, because you're usually the only chick in the weights room, and what I love most, is that men hardly if ever use a squat rack. They all use a smith machine these days. I have the squat rack all to myself... I love it - exclusive use!